Norwegian pop, pure and simple, from a fine female vocalist with a quirky sense of timing and arrangement. A lot has come to pass since Maria Solheim released her last album, “Frail”, two years ago. Since then, Maria has performed concerts in Germany, Great Britain, China, Thailand, Japan, The United States, Austria, Luxembourg and Switzerland, as well as in Scandinavia, including a “royal command” - performance at the christening of princess Ingrid, heiress to the Norwegian throne. - It was a little…different, indeed, laughs Maria. Usually when I perform, I tend to focus on familiar faces in the audience, and on that occasion the only people I "knew" where the crown prince and the crown princess. It was quite an experience. A great honour, and a nice memory to look back on later. The oncoming months, however, do not offer much time for dwelling on the past for Maria Solheim. This fall she publishes her first book, Den lille kaosboken (The little book of chaos) and she is staging an exhibition of her art, but right now her new, fourth album Will There Be Spring is first priority for Maria Solheim. Despite her tender age, Maria, who was discovered at fifteen while playing her first ever gig in a small fishing community in the arctic north of Norway, is now established as one of the country’s leading singer/songwriters. So how would she describe the difference between the Maria Solheim of today, and the teenager who made her debut on 2001’s “Barefoot”? - Experience has given me a sense of self-confidence, which has spurred me to take some chances. By all means, Will There Be Spring is not a “difficult” record, but it pushes the envelope a bit. A little bit more psychedelica, a little bit more madness. The fact that the album was recorded on analog equipment had a big influence on the final result, it has become a simpler and more direct record than it would have been had it been done digitally. 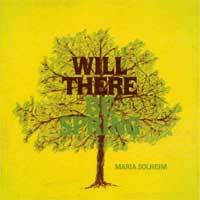 Will there be spring does not represent a radical new direction for the critically acclaimed Maria Solheim, but rather a continuation and an expansion of her collaboration with producer Emil Nikolaisen, who since their work together on “Frail” has had tremendous international success with his own band, Serena-Maneesh, The record, like her three previous efforts, is being released by Kirkelig Kulturverksted (KKV), a record label with countless awards to its merit. – No need to swap labels when you’re allowed total artistic freedom over everything, including the sleeve design!, she laughs. Will There Be Spring represents a major step forward for one of Europe's most exciting young artists and will add new converts to Maria Solheim’s loyal fanbase world wide.